This right here is a beauty of a dish. The way it looks is just the start. This is one versatile bowl of beans. Mainly, it is an excellent summer side dish to sandwiches and grilled meats, like the Brown Sugar Chicken. It is also perfect to pack for picnics and potlucks. A couple of spoonfuls rolled up in a sandwich wrap make for a nice light lunch and it is really tasty when scooped up with some good potato chips for a party dip. Aside from the creaminess of the beans, there is crunch from the onion and red pepper, sweetness from the tomatoes and vinaigrette, and a kick of heat from the jalapeño and hot sauce. Each bite will tell you a different story. I'm up to thirty-seven myself. There's a whole lot going on in this bowl of beans! In a large bowl, combine the black-eyed peas, tomatoes, onions, peppers, green onions, and parsley. In a separate bowl, whisk together the vinegar, oil, and sugar. Pour the dressing over the black-eyed pea mixture and toss until combined. Season to taste with tabasco, salt, and pepper. Allow the salad to marinate for several hours in the refrigerator before serving. Enjoy! You're right - this is a beauty of a dish. Love the versatility of it. Looks and sounds fantastic! 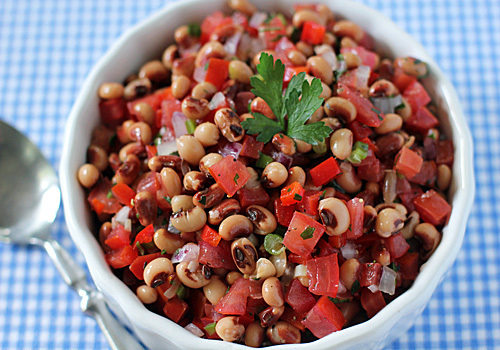 Would be a great way to get your black-eyed pea luck for the New Year. It is hard for me to say what is my favorite to eat this, but it is definitely a delicious hot weather dish. I made this yesterday for my husband and I! Wanted you to know we LOVE this salad! I think it would be great for a pot luck too! Our taste buds were woken up!